Have Beautiful Glass Splashbacks made to measure and installed in your Canterbury Property. We can print any photo, design, pattern or image onto glass in ultra high-quality vivid colour. Are you looking for a custom splashback for your kitchen glass splashbacks, kitchen island fronts, table & bench tops, shower wall panels, bathroom up-stands? Or perhaps a commercial reception area, shop fitting, retail stands, spandrel panels, signs, shop fittings, furniture or decorative wall panels? Here at graphic glass, we can modernise your home or workplace with beautiful designer glass. You pick the design, we use precision tools to cut and print a beautiful glass art for your needs. We can also print images and artwork directly onto glass. We do a test print to ensure the image quality. We print your design on glass. We install your design in your home. Do you have any questions? Give Martin a call on (03) 343 1044 about your project or come into our showroom for some inspiration. 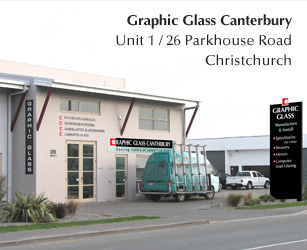 You can find us on Parkhouse Road, Unit 1/26, Christchurch, New Zealand. Hours: 8:00am - 4:00pm Monday to Friday. © 2004-2019 Graphic Glass. All rights reserved.